Snap Frames : A snap frame display stands 8 feet tall! Tall Displays Get Attention! 8 FOOT TALL DISPLAY STAND! This Snap Frame Display is tall! 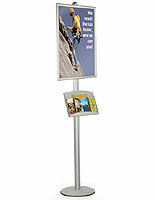 Show your 24" x 36" poster on an 8 ft display stand with a brochure holder! 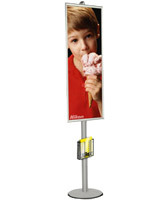 The Snap Frame Display is a versatile floor combination for both advertising and literature distribution. 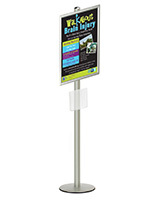 Towering over other sign stands, these floor stands make your message bold and prominent! 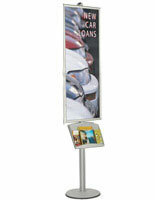 The snap open frame and brochure holder are infinitely adjustable anywhere along the 8 ft display stand pole. These Snap Holder stands are best suited for open indoor venues with high pedestrian traffic, like department store, bank, shopping mall, or lobby areas. This Snap Frame Display comes with one snap open holder and one acrylic literature holder. The snap frames make frequent graphic changes easy. Simply snap open the four edges and insert the graphic below the clear protective lens and snap the sides closed. The 2 1/4" deep acrylic holder accommodates any 8 1/2" x 11" printed material. 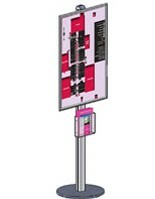 Both the poster frame and the acrylic holder are attached to the display stand pole from the top with connectors that fit into grooves in the pole. Adjusting the poster holder or brochure tray height is simple using connector screws that control sliding the poster frame or brochure tray on the display stand pole. 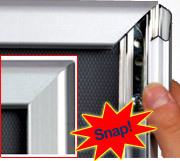 Snap frame display stands ship unassembled, but are designed for quick assembly with instructions provided.